New outside shower and expanded deck in a home renovated to blend into its natural site. This side of the cabin faces the water. Give the house a complete face lift and develop its character to blend with the site, a natural rock outcrop surrounded by native vegetation. Replace windows, siding, and roofing, rebuild the deck, and provide an outside shower and hot tub. Research replacing water supply and waste systems. 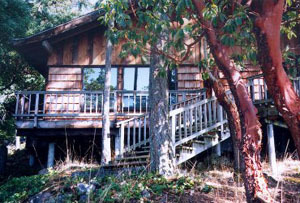 The waterfront side of the original cabin. The window area was significantly smaller and the interior much darker. Notice also the smaller deck and disparate siding materials. Integrate the interior with the site, with maximum access to the deck and unhindered visibility of trees, sky, and water. Create a new kitchen. Reconfigure and add custom cabinets to the dining/living room and master suite. Add a laundry in the mud entry, remodel the hall bath, and add storage. 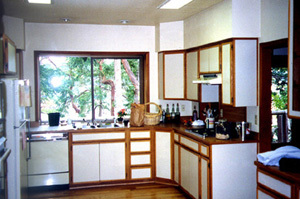 The original kitchen, with generic cabinetry and counters. 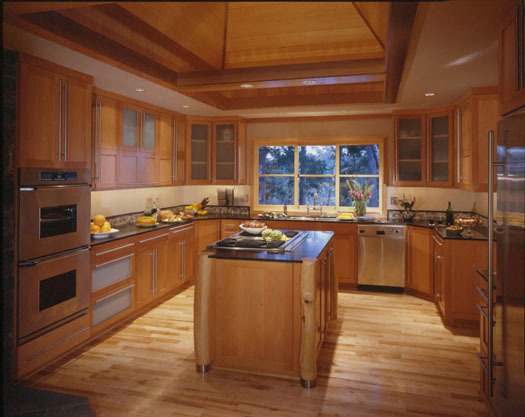 Compare the renovated kitchen with madrona cabinets and a cooking island under a new skylight. 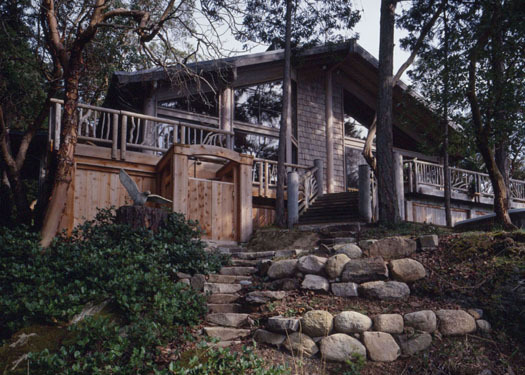 Blended the house into the site through the addition of log columns, shingle siding, and wood windows. Removed brown brick veneer from the walls and chimney and replaced it with stone. Rebuilt and expanded the deck, using local log columns for the main rail supports and tree limbs as a balustrade to produce a rustic Adirondack look. Designed a hot tub and outside shower/cleanup area into the deck structure. Replaced the existing roof with a long-lasting metal roof. Added log columns inside the house to develop the lodge-like feeling. Installed natural finished wood windows and doors to maximize the view of the site and water and to access the deck with wide openings. Replaced all interior surfaces, including refinishing the fireplace in stone. Added built-in cabinets to the dining area. Added an all new kitchen with a large skylight, natural finished madrona cabinets, and honed black granite countertops. Installed a new wood stove with the chimney reveneered in stone to match the exterior. Added a large pantry next to the doorway leading to the mud entry, which was expanded with a laundry and coat storage area. Completely refurbished the existing hall bath. Remodeled the master suite, including addition of a large bookcase. 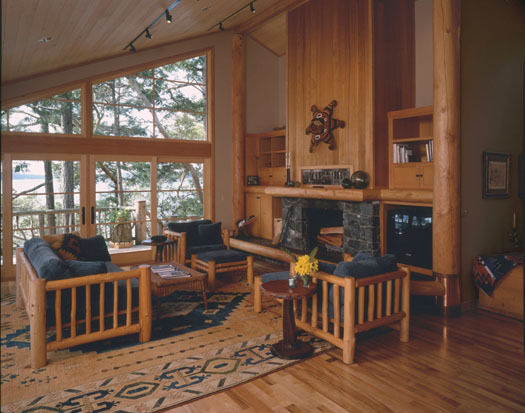 Renovated living room with new log columns, expanded windows, and fireplace resurfaced in stone. 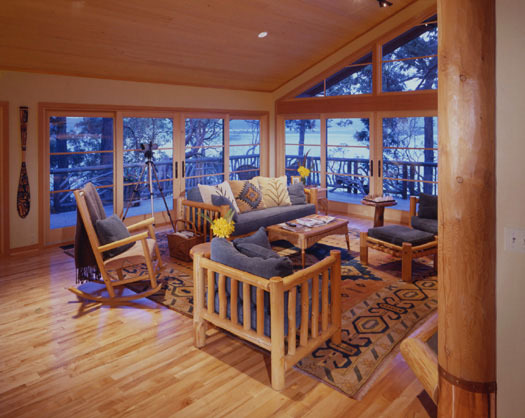 Another view of the living room, showing the deck and view of trees and water. South view of the new kitchen with a gas-stove island. 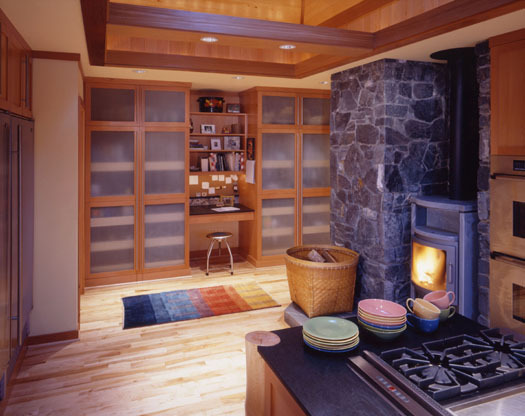 Cabinetry is natural finished madrona. North view of new kitchen showing pantry and wood stove chimney reveneered in stone. 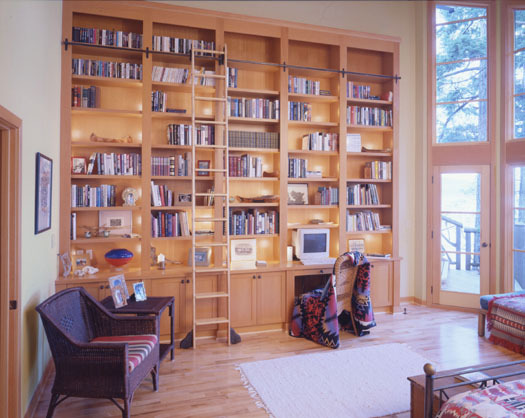 Master bedroom with custom built-in bookshelves and access to the deck.